Crenellated octagonal Gothic church (currently disused, 2009) with advanced single-bay sections to S, E, W and N; that to N with inset 5-stage steeple with stone polygonal spire. Ashlar. Base course, crenellated parapet. Narrow rounded shafts to outshot angles supporting angle round projections above. Pointed-arched window openings with moulded architraves. This 1807 church has significant historical and streetscape importance. 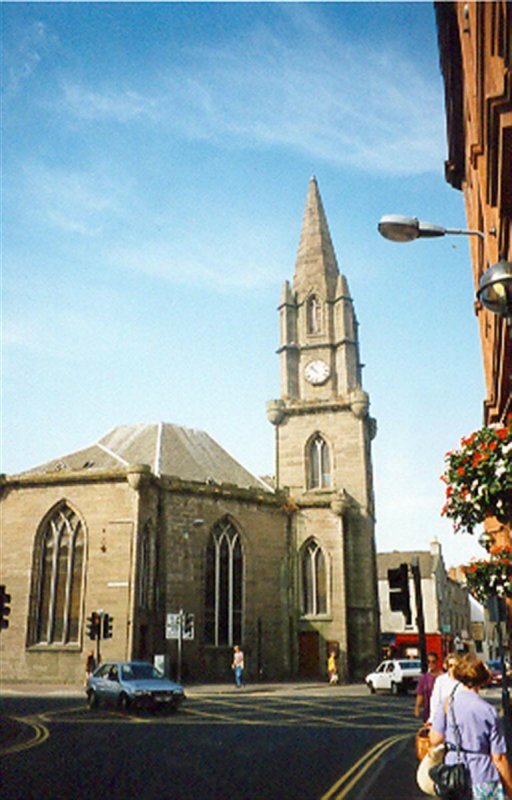 It was one of the first churches to be built in Perth after the Reformation, as the population of the city was expanding and a new church was required. Situated at the head of the High Street, it is a focal point of the city when looking West. The octagonal, central plan was unusual in church design at the early part of the 19th century. 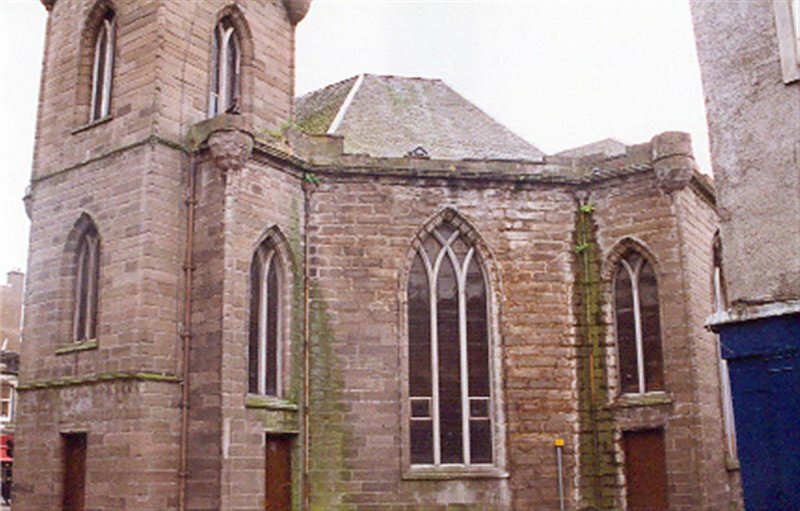 The interior was not visited as part of the resurvey, but is noted by J Gifford in Perth & Kinross, 2007 to contain a gallery to 7 sides of the octagon and cast iron railings to the stairs to the pulpit. 26 January 1973: Press reports note that the church's lead roof requires replacing. 1 February 1973: Press reports note that the church is threatened with closure, with its congregation moving to nearby St Mark's, unless funds can be raised for essential repairs. £10,000 is needed for interior repairs, with £15,000 for external repairs. The church is suffering from dry rot. Subsequent press reports note that the fundraising appeal has received several bequests. 13 February 1974: Press reports note that the church is threatened with closure at the end of the present ministry. Although essential repair works are now underway, further funds would be required to bring the church up to modern day requirements. 18 May 1984: Press reports note that the church remains under threat of closure, along with several others in Perth. 1986: The church closes. 8 October 1988: The Dundee Courier reports that the church has been cordoned off following fears of a roof collapse during high winds. Sections of masonry have recently fallen from the building and now lay beside it. Fears arose after a survey of the building was conducted by the Council's Environmental Health Department. 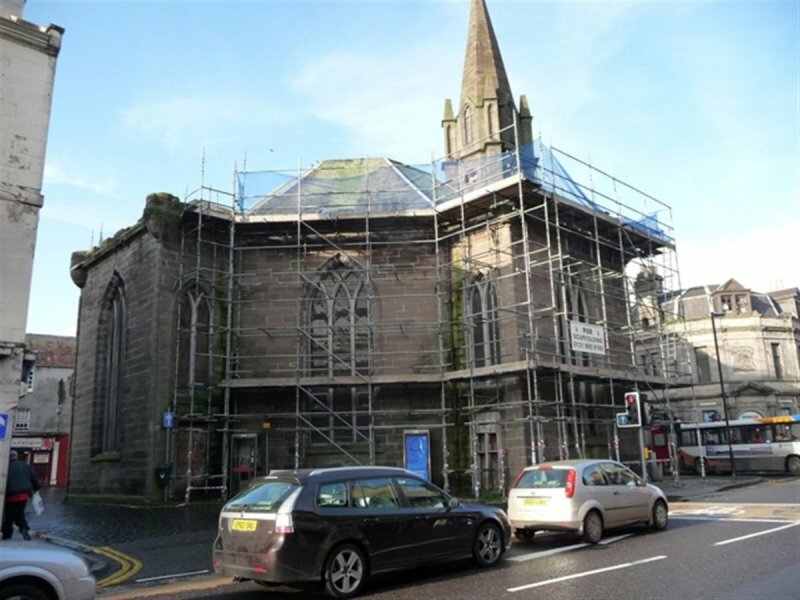 The church is currently under offer to developers keen to convert it into licensed premises. Previous proposals saw it being converted into dwellings. 11 October 1988: The Perthshire Advertiser reports on the dissatisfaction of local shopkeepers who are keen to see the church demolished. 8 February 1989: The Dundee Courier reports that Kirkcaldy-based Dean Entertainments has dropped plans to convert the church into a licensed bar. 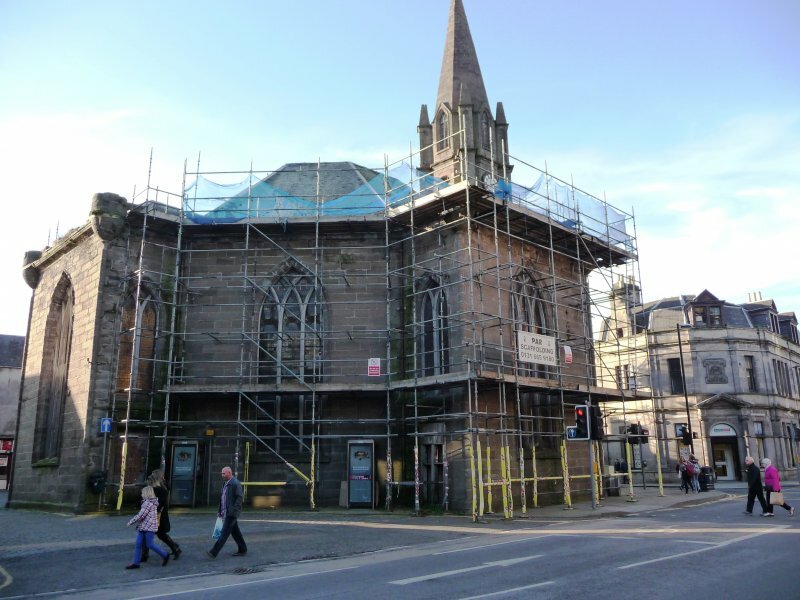 The building has now been made safe, and is due to be marketed again by the Church of Scotland. 31 March 1989: The Perthshire Advertiser reports that permission has been granted to remove the church's organ. A local Councillor is now calling for demolition. October 1989: The church is bought by Cleddans Estates Investments Ltd, Blanefield, who plan to convert it into a planetarium. However, lack of agreement with the Tayside Regional Council's Roads Department leads to the plans being abandoned. 19 July 1991: The Perthshire Advertiser reports on proposals by Cleddans to turn the church into a universarium and science centre. The Dundee Courier repeats the story. 7 September 1991: The Dundee Courier reports that plans include a domed projection room with seating for 175. Local planners are supporting the scheme. Historic Scotland would prefer to see the present interior retained, although it accepts that sustained new uses will inevitably mean a loss of some original character. Councillors are now to debate serving a Repairs Notice. 21 October 1991: Press reports note that Outline Planning Permission has been granted to the scheme. Funding of £500,000 may be forthcoming from the Scottish Tourist Board. 10 November 1992: The Perthshire Advertiser reports that the church is suffering from sustained vandalism. 20 April 1994: The Dundee Courier reports that the project is now to be called The Dome, and it is hoped to open by Christmas 1995, although funding applications remain to be resolved. November 1994: The church is put up for sale by Cleddans, whose plans have faltered due to a lack of funding. April 1995: A Repairs Notice is served. 16 June 1995: The Perthshire Advertiser reports that the Scottish Urban Archaeological Trust now plans to convert the church into the Perth Octagon Heritage Centre. It is hoped to conduct a feasibility study and purchase the church from Cleddans. The church would hold interpretation exhibitions, a camera obscura, café, shop, and outreach facilities. £10,000 has been received from Scottish Enterprise Tayside to contribute towards the feasibility study, with match funding from the Perth and Kinross Heritage Trust. 20 April 1996: The Dundee Courier reports that the plans are to go before local Councillors. 26 April 1996: The Perthshire Advertiser reports that Councillors have supported the plans, albeit with some reservations over vehicular access and funding. 5 July 1997: The Dundee Courier reports that the church has been cordoned off due to falling masonry. 29 July 1997: The Perthshire Advertiser reports that the Scottish Urban Archaeological Trust has failed in its bid to purchase the church from Cleddans. There are concerns that Cleddans itself has now folded, with its managing director having moved abroad. The ownership of the church is now uncertain. 21 November 1997: The Perthshire Advertiser reports on plans by Icefuse to convert the church into a bar/restaurant. December 1997: SCT commends certain aspects of the scheme, but advises caution over other elements due to a lack of detail. 9 January 1998: The Perthshire Advertiser reports that local planners are recommending that the plans be approved. The roof and clocktower would be repaired, and stonework cleaned. Although the pews would be removed, the pulpit would be retained. New raised floors and dropped and glazed ceilings would be installed. 16 January 1998: The Perthshire Advertiser reports that a decision on the plans has been deferred to consider more 'appropriate uses' for the building. The application goes to appeal. 18 September 1998: The Perth Advertiser reports that plans by the St Paul's Church Preservation Society to turn the building into a cultural centre have won the approval of Councillors. A shop and restaurant would be created, along with offices and meeting rooms for archaeology, arts, and heritage organisations. October 1998: The Scottish Office Inquiry Reporter notes that thieves have removed the pulpit, gallery balustrades, font, and wall monuments. The Reporter finds in favour of Icehouse in its appeal. 15 January 1999: The Perthshire Advertiser reports that the Perth and Kinross Heritage Trust is maintaining an interest in the church. October 2000: External inspection reveals tarpauling of the roof spire and some repair works to be in progress. December 2000: The Architectural Heritage Fund offers £4,375 to the St Paul's Preservation Trust to fund a feasibility study into uses for the building. The study concludes that the church could accommodate a farmers' market. 27 May 2003: The Dundee Courier reports on continued plans by SPPT to convert the church into community halls housing farmers' and craft markets. December 2003: Perth and Kinross Heritage Trust reports that SPPT has now been wound up, and conversion plans have collapsed. The owners are likely to apply for demolition consent. 23 January 2004: The Perthshire Advertiser reports that the Perth and Kinross Heritage Trust has urged the Council to use its powers to save the church. The Council has indicated that it would not be prepared to assume ownership of the building. March 2004: Perth and Kinross Heritage Trust reports that SPPT has disbanded. The owner is to sell the church to developers at the end of the month, who are confident that permission to demolish will be granted. 23 July 2004: The Perthshire Advertiser reports on the building's inclusion in the Buildings at Risk Bulletin 2004-2005. 27 August 2004: The Dundee Courier reports on local concerns over the church's condition. 8 July 2005: The Perthshire Advertiser reports that the Royal Scottish Geographic Society may take over the building for records storage. 27 July 2005: The Aberdeen Press and Journal reports that Perth and Kinross Heritage Trust now has a 2 year option to buy the church, but must first demonstrate a viable end use. Perth and Kinross Council has granted £48,000 towards repairs. The Dundee Courier repeats the story. February 2008: Courier and Advertiser reports that one of the massive windows appears to have blown in during the recent storms. The article goes on to report that Perth and Kinross Council have recently launched a bid to recoup nearly £100, 000 on money previously spent making the church safe. New plans are reported to be in progress by JD Wetherspoon submitted a planning application to convert the site into a licensed premises. April 2008: Perthshire Advertiser reports planning consent has been given to JD Wetherspoon for the development of the church into a public house/ restaurant. Councillors are reported to have expressed their disappointment that previously approved, more ambitious plans, were not put into action. 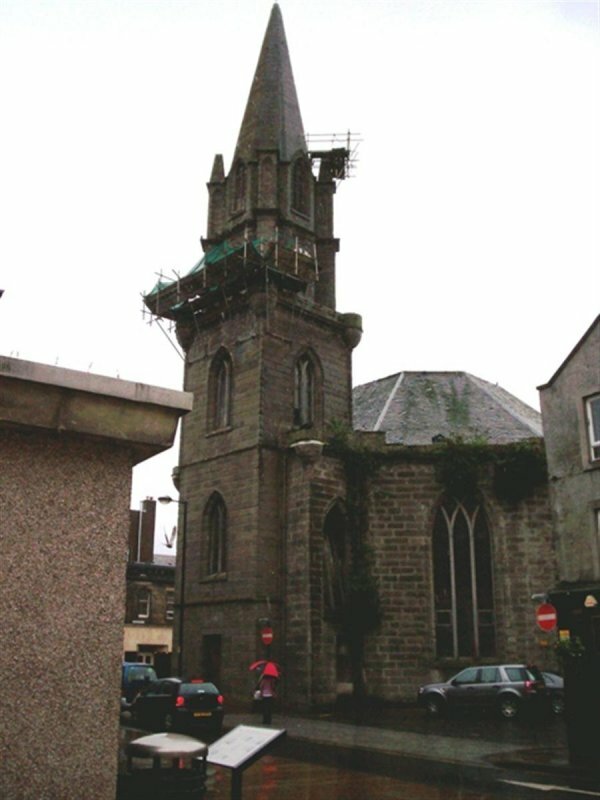 August 2008: The Perthshire Advertiser reports that the owners of the church have pulled out of the redevelopment of the building. Local campaigners are reported as aiming to take on ownership of the church. September 2008: Perthshire Advertiser reports on proposals by an action group to turn the church into a community centre; plans to be unveiled at a public meeting. January 2009: The Press and Journal reports that a former member of the St Pauls preservation trust has expressed concern for the condition of the building and suggested it be consolidated as a ruin for use as a focal point and for its townscape value. March 2009: Perthshire Advertiser reports on a rescue plan through the establishment of an Indian restaurant. The local authority are noted to be keen to work towards resolution of the issue of the former church. August 2009: External inspection finds damp patches and bushes growing down the down pipes, suggesting that they have failed. There are slipped slates causing concern over leaks in the roof. One large window on the west elevation is leaning inwards. Pigeons are flying in and out of the structure. 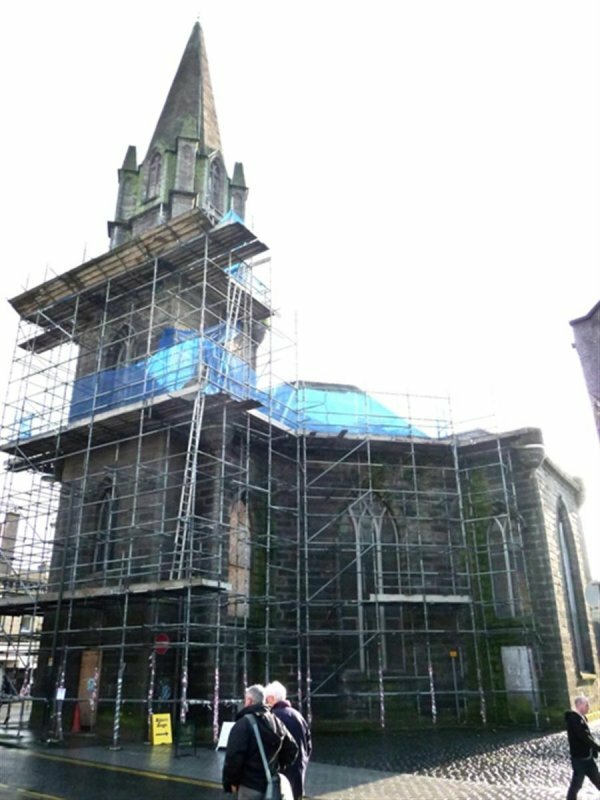 November 2009: A member of the public contacts SCT to note that scaffolding is present on the right-hand side of the building just below the church steeple. February 2010: Perthshire Advertiser reports on plans under discussion between the new owners of the building, Kushis and Historic Scotland on ways to succesfully convert the church into a restaurant. 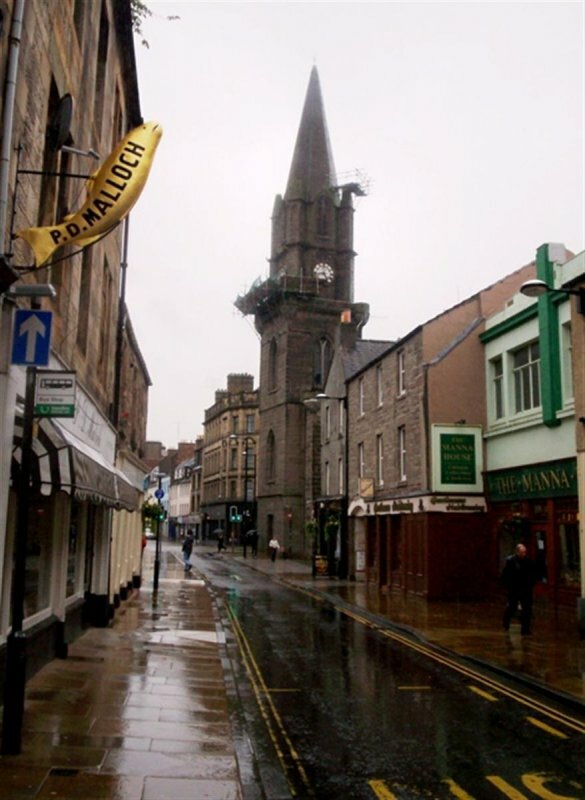 May 2010: Pershire Advertiser reports that a council officer told the Perth and Kinross Councils enterprise and infrastructure committee that the churchs owners are expected to submit plans imminently. April 2011: Local planners advise that the new owners remain committed to the project. It is hoped that the relevant permissions will be lodged with the local authority in the near future. November 2011: External inspection finds since the previous site visit scaffolding has been erected, a broken window in the north elevation has been boarded up and plants removed from the same elevation. Planning permission and listed building consent for change of use and conversion to a restaurant with ancilliary uses was lodged with Perth and Kinross Council in Oct 2011 ref: 11/01840/FLL & 11/01841/LBC. 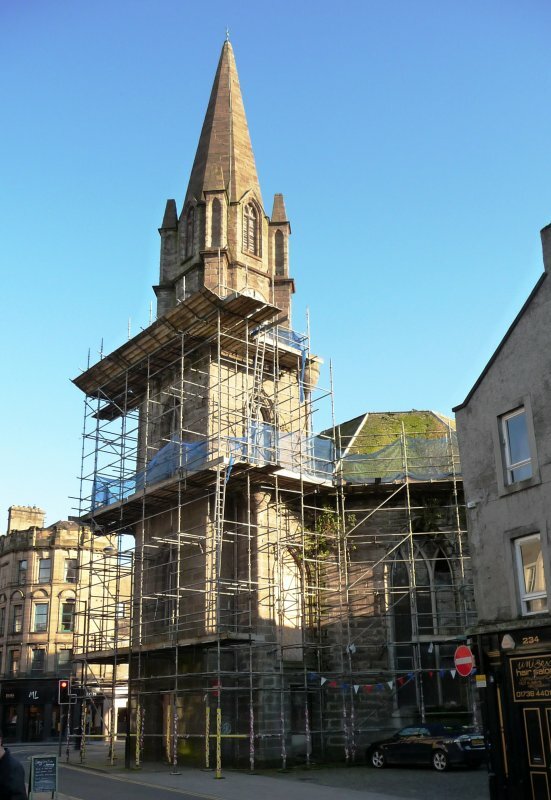 7 November 2012: The Courier reports restaurant chain Khushi's is set to repair the former church, bring it back into use as a restaurant with full repair of the clock and steeple. The building will also host display material on The Black Watch regiment. 11 March 2014: External inspection finds the building remains in much the same condition as seen previously. Full Planning Permission for change of use to form a restaurant was conditionally approved Jan 2012 ref: 11/01840/FLL. Listed Building Consent for restoration works was withdrawn (11/01841/LBC) but a revised application was conditionally approved Oct 2013 ref: 13/00744/LBC. 2 May 2016: An Urgent Works Notice has been served upon Arengate Limited by Perth and Kinross Council listing a series of works to be undertaken at the site by 1 June 2016 (16/00104/LISTED). 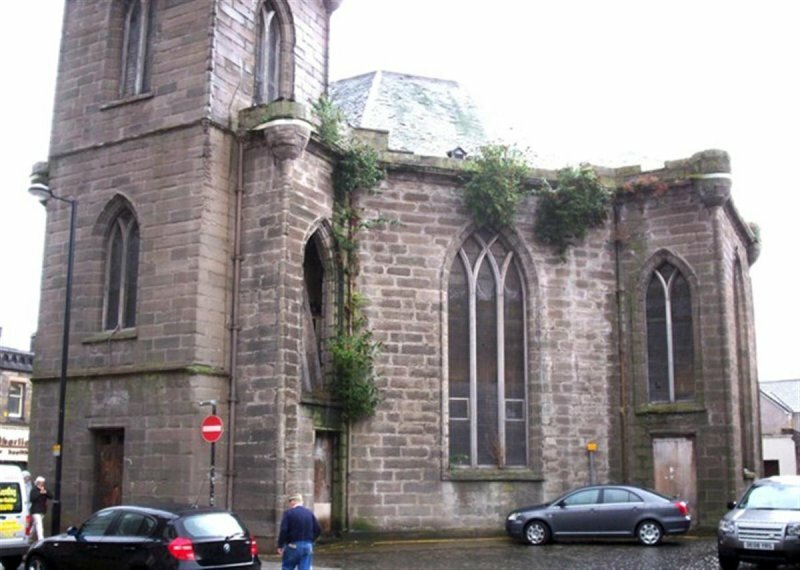 6 December 2016: Urban Realm reports on a proposal to consolidate the former church into a walled outdoor space by Perth and Kinross Council. 15 February 2017: The Courier reports (14/02/2017) on emergency works being carried out at the former church by Perth and Kinross Council. 18 April 2018: Listed Building Consent for alterations to the building is being sought ref:18/00501/LBC. 23 October 2018: The Courier website reports on the commencement of the restoration and conversion of the former church into a civic space. Listed Building Consent for alterations (noted previously) was approved Jul 2018. Moved to Restoration in Progress. Hay (1957), p123; Haynes (2000), p19.